As many of my readers know, I'm very much a Linux fan. While my main computer at home has Windows 7, I'm always tinkering around with Linux. In fact, the only reason I have a computer with Windows on it is because the formatting program I use for papers in college isn't cross-connected to OpenOffice or LibreOffice. Otherwise, I'd be done. My Linux days started in the early 2000s with Redhat, then to Ubuntu, and then I got frustrated. I did not like Unity at all. Furthermore, it bothered me that Ubuntu made it so difficult to switch to Gnome desktop from Unity. When my wife got her final date for our daughter's birth, I started thinking about Linux again. My Windows laptop is a desktop replacement and weighs in like one. I needed something light for the hospital, so I got out my old MSI U120 and cleaned the hard drive and went Linux shopping. I briefly tried Ubuntu 11-10 again, but still didn't like it. Then I tried the newest Fedora, but it's been a long time since I've really liked Fedora. Finally, I settled on Mint. I've shied away from Linux Mint since it's inception because I felt that it probably went too far away from the source. It is, after all, built on Ubuntu, which is built on Debian. Then there was the statement made by the founder a few years ago about the government of Israel. I should note that there were no disparaging remarks made against the Jewish people, just the government. I suppose that would be akin to people not liking the Obama administration but not hating the African American population. Anyway, I just felt that there was no need for a Linux programmer to be involved in politics and activism. We're trying to make Open Source software like Linux more accepted in the technology community, not in the political arena. 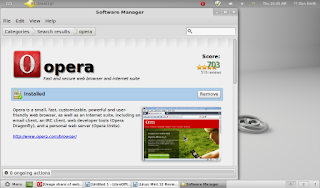 Despite these issues, I broke down and gave Linux Mint 9 (Isadora) a try because I found a copy. I liked it immediately. It was based on Ubuntu 10.04, which was the last Ubuntu release I liked. It had a great feel to it, although I confess it struggled a little with immediately recognizing my network connection and wireless hardware. It came pre-loaded with Openoffice, which was fine with me. After tinkering around with it for a few days, I decided to upgrade to the newest Mint. Downloading and Networking: Downloading Mint 12 (Lisa) was a breeze. I used Unetbootin to format a thumb drive to load it onto my U120 and I was running very quickly. Like Ubuntu, installing Mint is a dream. One you start installing, it walks you through the process step-by-step. Unlike Isadora, it found everything perfectly. I was on the internet faster than I could sneeze. Even moving to a new network in the hospital has posed no problems. It simply discovered the network and I clicked on it. Soon enough, I was posting pics of our beautiful new daughter on my blog. The Desktop: The look and feel of Lisa's desktop was very similar to Isadora, despite the fact that Lisa uses Gnome 3 and Isadora uses Gnome 2.3. For those who don't know, there were quite a few changes in the look and feel of Gnome when it rolled out Gnome 3. I appreciate the changes that Gnome brought to the desktop with Gnome 3, but I also like what Mint did with MGSE (Mint Gnome Shell Extensions) to make it look like the standard Mint experience, which I have grown to enjoy. The Menu button at the bottom will get you to everything you possible need. It only took me a few uses to get moving in the new format since I had been used to Unity or Gnome 2. It won't take you long either and if you're coming from Windows only, it will probably be even easier. Openoffice or LibreOffice: There are several people who believe that Openoffice is off the reservation. It's such a big deal that a bunch of former programmers left the organization and founded their own office suite, called LibreOffice. Here's a secret: It's practically the same thing. Honestly I don't know how the get away with it, except that Openoffice is open source software. 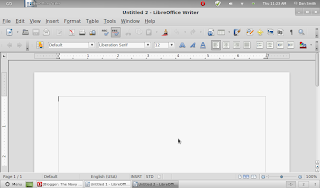 What will happen with LibreOffice makes people mad and then some of those programmers leave? Probably the same thing. 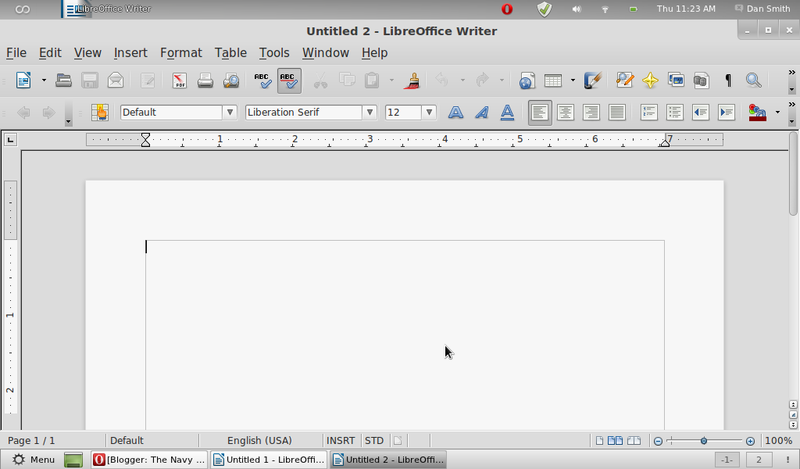 Anyway, if you can use Microsoft Word, Excel, PowerPoint, etc, then you can use LibreOffice. I'm typing this post on it now. Internet: As I stated above, Lisa comes standard with the drivers I needed to get online quickly. She also updated fast to the most current source. Lisa comes standard with Firefox, which is the most popular non-Microsoft browser, at least until a few months ago. 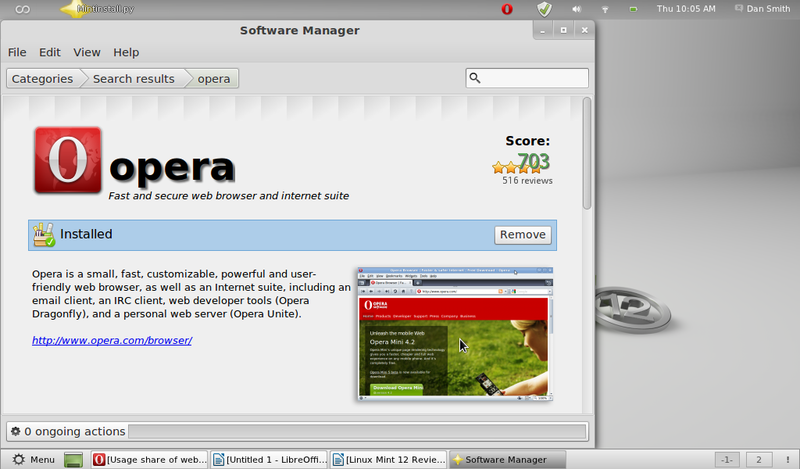 At any rate, I prefer Opera for a variety of reasons, so I downloaded it. As usual with Linux, it was a snap to get via the Software Manager. 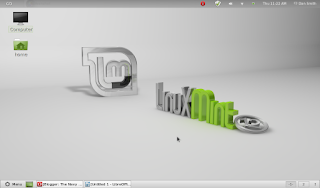 Summary: You need to get on board with Linux Mint. Of course, that means that we all need Ubuntu to keep releasing great OS updates, but in the long run, I think Ubuntu is headed in the way of Debian. It will become the branch of Linux that Linux distros are made from. Should be interesting to see how it all unfolds. While I watch that happen, I shall enjoy Linux Mint 12.